A (long) while ago I blogged about a Macro to make it a lot easier to work with (SharePoint) resource labels. It will then add the resource key to your existing resx file, it will type in “$Resources:….” as needed. If it’s an aspx/ascx file it will also throw in some “<%=” and “%>” tags. It will save me 1 minutes every time I need to do a SharePoint resource AND it will make it almost a no-brainer to always use resources instead of a hassle. However there is no reason to limit this to SharePoint development; it can be used throughout. Other tools like Resharper and Coderush have their own way of doing it, but they really didn’t work well with the SharePoint way of handling resources. Go to Visual Studio 2013, Extensions and Updates and search for “Delegate” or “Smart Resource”. Sorry about missing support for Visual Studio 2012, some of the references for the options dialogs have changed and I didn’t want to maintain two code branches. It will look for a resx file named the same as your project first, if not found then “Resources.resx”, then “*.resx”. If you have more than one candidate it will error out. Substitute with your own resource lookup method. There are possibly many areas of improvement, for now it is a time saver for me. A while ago I wrote a post on setting up HyperV networking where I basically bridged all networks to the guests and let them worry about which one they needed to use. Albeit a little complicated it worked pretty good. However sometimes the guests messed it up and couldn’t figure which network to use for the AD and DNS and also the Default Gateway setting could be stuck on the “wrong” network. Therefore here is a new and vastly better approach J – using only one internal network and the windows Internet Connection Sharing (ICS). Caution: The two network configurations are inherently incompatible; you should choose only one to go for. Is quite simply that I want my VMs to just work seamless with my Host machine and whatever network connection I’m using and – in my case – a guest AD. This used to be really simple with VMWare Workstation but after converting my machines to Hyper-V there is a catch or two. Note that this applies to a mobile working scenario where I run everything on a laptop and it frequently changes whether I’m using a wired, wifi or mobile net. I do SharePoint development and this post is written in that context, however it should all be generally applicable to Hyper-V. In addition I need to connect with Remote Desktop to the guest machines with the host (the Hyper-V console is useless for all but boot and network configurations). That’s it for the host. Lookup an AD user or two – do you have a proper connection between the guests? Ping 192.168.137.1 – does your gateway respond? Ping 8.8.8.8 – do you have basic external network? Ping google.com – do you have DNS resolution working? Browse a site – is the firewall open? That’s it for the guests! Finally you’ll want to access the guests through RDP so stuff like copy/paste and fullscreen works. You can of course use whatever RDP manager you prefer, here I’ve just used the standard one. Make a connection for each Guest access and save it somewhere (Desktop?). Run the command “mstsc” and setup the options you like and save the Connection. In particular enable “Clipboard” and “Drives” in the “Local Resources” tab. That will enable you to copy/paste both text and files between the guest and host. Note that I have added “sp2010” in my host file as 192.168.137.10. You can also use just the IP. Now for the fun part. I want it all to to just work. No fiddling around with sharing this or that network adapter, just make the one I’m using for the host the one that is shared. Using PowerShell and the system task scheduler it’s doable. One caveat: The HyperV network will jump briefly when the network changes, so your RDP session will briefly freeze. It assumes that there is only enabled HyperV network adapter (if not change the marked line) and it will pick a random active internet connection to share if there is more than one. Note: I’m dependent on the “ICSManager” module developed by Utapyngo for handling the ICS part. Here are the few things that I found myself needing. If you have more than one HyperV teams, e.g. multiple AD controllers that should be kept separate, you need to split the network. As the ICS service will reset your hosts’ HyperV adapter to an ip of 192.168.137.1 and reset all submask and DNS settings, you shouldn’t mess with them. And subsequent guests IPs within their network range. Keep the default gateway as 192.168.137.1 for all guests. In the case of multiple HyperV cards you will need to modify the PowerShell script file, to select the proper HyperV card to share with. Simple give your desired HyperV adapter an easy readable name in the host. Perhaps just hardcode the HyperV adapter name in call to the “Enable-ICS” commandlet. And to be fair inferior in the type of operation you can be perform. It is essentially CRUD operations, especially in the SharePoint 2010 CSOM. This post is about how to use it in PowerShell and a comparison of the performance. First, there is a slight problem in PowerShell (v2 and v3); it cannot easily call generics such as the ClientContext.Load method. It simply cannot figure out which overloaded method to call – therefore we have to help it a bit. The following is the function I use to include the CSOM dependencies in my scripts. It simply loads the two Client dlls and creates a new version of the ClientContext class that doesn’t use the offending “Load<T>(T clientObject)” method. I nicked most of this from here, but added the ability to load the client assemblies from local dir (and fall back to GAC) – very useful if you are not running on a SharePoint server. throw "Could not load Microsoft.SharePoint.Client.dll or Microsoft.SharePoint.Client.Runtime.dll"
Write-host "Url: $($_["FileRef"]), title: $($_["FileLeafRef"]) "
It doesn’t get much easier than that (when you have the AddCSOM function that is). It is a few more lines of code than you would need with the server OM (load and execute query) but not by much. The above code works with both 2010 and 2013 CSOM. $t = "Url: $($_["FileRef"]), title: $($_["FileLeafRef"]) "
Write-Host "Total duration: $($duration.TotalSeconds), total memory consumption: $(($memafter-$membefore)/(1024*1024)) MB"
$t = "url: $($_.Url), title: $($_.Title)"
And executed them against a document library of 500 and 1500 elements (4 measurements at each data point). As you can see it is MUCH more efficient to rely on CSOM and it scales a lot better. The server OM retrieves a huge number of additional properties, but it has the benefit of going directly at the database instead of the webserver. 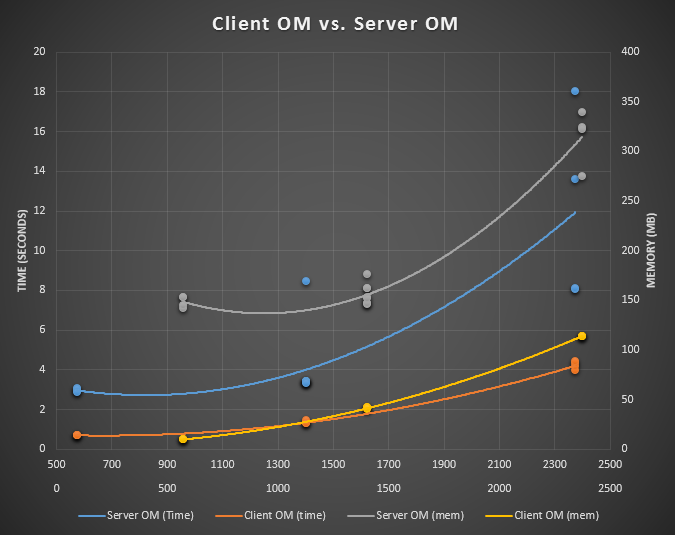 Curiously the CSOM version offers much more reliable performance where the Server OM various quite a bit. 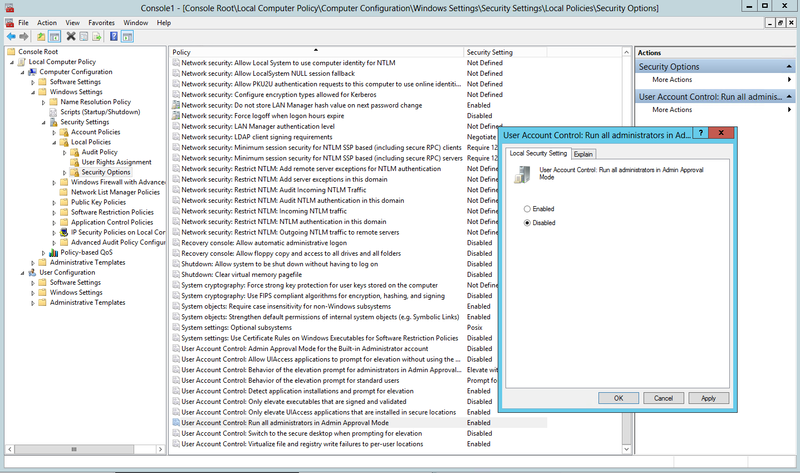 In addition you get around the limitation of Shell access for the powershell account and the need for server side execution. Might be convenient for many. The only downside I can see with the CSOM approach is that it is unfamiliar to most and it does require a few more lines of code. IF your specific need is covered by the API of course. It’s faster, more portable, less memory intensive and simple to use. Granted, there are lots of missing API’s (especially in the 2010 edition) but every data manipulation need is likely covered. That is quite a bit after all. Lately I have been doing quite a bit of PowerShell remoting (mostly in a SharePoint context) and while it is surprisingly easy and useful there are a few hoops I’ll detail here. I have been a fan of PowerShell ever since TechEd ’06 in Barcelona where some young chap eloquently introduced PowerShell. Everyone in the audience understood the potential. Since then it is now so pervasive that I don’t have to waste time to argue it’s role and prevalence among scripting languages – and the remoting part once again is head and shoulders over the alternatives (even SSH on the unixes). For remoting in a SharePoint context, there are 3, perhaps 4 steps, for other purposes you wouldn’t hurt yourself to go through the same. Note: Everything in this post must be executed within an administrative PowerShell console. Note: There are about a gazillion settings and variations that I’ve skipped; this is how I normally do it. This one is dead simple. In a PowerShell shell (in admin mode) – just press return for every confirmation prompt; the defaults are sensible (or add “-force”). By default each remoting session will have a cap of 150 MB of memory assigned to it. After that you’ll get a more or less random exception from the remoting session; it may be really hard to figure out what went wrong. When you work with SharePoint you can easily spend 150 MB if you iterate over a number of SPWebs or SPSites. It may not even be possible to limit your consumption by disposing explicitly (use start-spassignment for that) if you actually need to iterate it all (Side-note: When the session ends so does all allocated objects – whether you Dispose them or not doesn’t matter). Let’s face it these are often expensive scripts with a lot of work to do. Which will set the limit to 1 GB. If you need to do any SharePoint or IIS administration (or a hundred other tasks) you need your script to run with Administrative rights. The PowerShell remote process does not request administrative rights from windows – it’ll just use whatever is assigned to it. Before you accuse me of disabling all security take a good long read at this article from Microsoft; they actually do recommend to disable UAC on servers provided that you do not use your servers for non-admin stuff (that is NO Internet browsing!). To test whether or not UAC is enabled start a PowerShell console (simply left click the powershell icon). Does it say “Administrator:…” in the title? If yes then UAC is disabled and you are good to go. You should take a step back here and ask your local sys admin whether this is a policy enforced by him or whether or not it should be. He/She can create a new policy that targets specific servers to disable UAC. If all goes well you’ll see that the prompt changes a bit and every command is now executed remotely. Do a “dir” and check that you see the remote server’s files and not the local ones. Type “exit” to return to the controller. If you are going cross domains you’ll receive an error, execute step 4 (below) in that case. Note that the script file (“ScriptToExecute.ps1”) is local to the controller and WinRM will handle the mundane task of transferring it to the client. The script is executed remotely and therefore you cannot reference other scripts as they are not transferred as well. And you can of course pass arguments to your scriptblock and combine it in a hundred different ways. The remote sessions are new PowerShell sessions; whatever information/variables you need you must either pass as arguments or embed within a scriptblock. You can pass simple serializeable objects back to the controller on the pipeline, but it will not work to pass COM/WMI/SharePoint objects back. Step 4: (Optional) Going Cross Domain? By default PowerShell remoting will connect to the client computer and automatically pass the credentials of the current user to the client computer. That is normally what you want and ensures that you need no credentials prompt. Add the client servers to the controller servers list of trusted hosts:set-item wsman:localhost\client\trustedhosts -value $serverList -forcewhere $serverList is a comma separated string of computernames (I use FQDN names). … and it should work. There are a million details regarding forests, firewalls, etc. I’ll not go into here. After some time your dev box ends up looking like a well-used tool shed complete with unused tools and cobwebs in the corners. While it’s quick and easy to get rid of half the icons on your desktop and delete droves of temporary working files – I always end up returning to a few well used scripts to get my much needed disk space back as well as a cleaner and faster box. Often the trigger is exhausted disk space. These are the scripts I always end up using. If you are making site definitions (or web templates) you’ll likely end up with tons of small test site collections over time. I often use scripts to create them named after the current time. In human terms: “Delete every site collection that is not a root site collection and that have not been modified within the last two months”. Phew. Do NOT run this in production. Next I ensure that all my local databases run in simple recovery mode, i.e. avoid huge transactions logs that need to truncated once in a while. Run it within the SQL Server Management Studio. Note that it is likely that the script will report a few minor errors if some DBs are detached/offline. Never mind. Finally save some much needed space by shrinking the DB files. After site collection deletions and recovery mode changes there are likely a lot of space to be freed within the DB files. If the three steps above didn’t free enough space for you, the solution often is to just expand the VHDs on your virtual machines. It’s a fairly easy process in both VMWare and HyperV it only requires you to turn off the VM, remove any snapshots, and expand the disk using the wizard for it. This will only expand the VHD; your partitions will not grow, so you need to do that next. You can use the disk management tool for it – however I find it cumbersome. Especially if it is the system disk you’re expanding it is awkward. I prefer to use GPartED, which is a very nice linux partition editor. It is a downloadable iso that is a breeze to boot into and expand the partition whether it is the system or not. One note: In a typical Linux way you are asked all sorts of questions at boot; just hit return at every one of them. Who cares about the keyboard layout for a GUI program with big buttons anyway? Here is a quick post with a small script that I find incredibly handy for managing my local Hyper-V machines (on windows 8). It simply ensures what set of VMs are running at a given time – attach that to a shortcut on the desktop and it saves me 3 minutes every day; I find it useful. Why? Quite often, I need to switch from one set of VMs to another for different tasks (VMWare term is “teams”) e.g. switching between SP2010 and SP2013 development. Sometimes just turn them off if I need the resources for something else. Normally you just go into Hyper-V manager and start/stop the relevant VMs. Automating that was quite simple and painless – the download is here. This is a simple Powershell script that adjust what VMs are running on the local Hyper-V host. development task to another, i.e. switch teams. Requires admin rights to run. Start using admin shell or use one of the provided batch files. I assume that the PowerShell Hyper-V module is loaded; it has always been the case in my tests. I have a number of batch files for easily executing the script, one for turning off (suspend) all VMs, one for a SP2010 team and one for the SP2013 team. It’s a one-liner bat file that will work with both PowerShell 2 and 3, with or without UAC. If you have UAC enabled (as I do) you will be prompted, otherwise it will just suspend/resume the relevant VMs. It took about two hours to write the scripts, where the hardest part was getting the batch files properly in shape with escape characters and UAC. A catch: In my case the mobile adapter was not selectable (not sure if that is always the case) when I create a virtual switch. You should now have a number of network adapters that are connected to the host’s physical adapters and it will automatically figure out which ones are connected and use whichever is appropriate. I recommend that you named them appropriately in the guest. Run the command “mstsc” and setup the options you like and save the Connection. In particular enable “Clipboard” and “Drives” in the “Local Resources” tab. That will enable you to copy/paste both text and files between the guest and host. Will also grant access to the host’s drives. Going for the Advanced Mode? While the settings above work fine; there is always room for improvement. I think it would be better to install a third machine as a firewall/router so the firewall handled all external connections and boxed in the essentially rogue guest machines. They really only need to communicate externally on port 80/443. Once in a while something goes wrong. Sadly. My normal way to troubleshoot is simple to do a “tracert http://www.google.dk&#8221; and to notice what network adapter is being used for the communication. Sometimes it picks the wrong nic (one without Internet access) for whatever reason (you did remember to set the metric above, right? This is what it does). “Ipconfig /flushdns” sometime solves the problem otherwise disable the offending nic in the guest (temporarily).